Jack spent three years in the US Army in the enlisted ranks and seven years in the US Air Force as an officer and pilot. He flew T-37s, T-38s (part of our logo) and C-141s. Jack received the Air Medal on his very first mission in the Air Force. Jack has seven years’ experience in the pavement maintenance, parking lot striping and franchise industries. At his previous position, he took an early interest in helping veterans returning from the Iraq/Afghanistan conflicts offering veteran discounts on franchise fees and sponsoring an all-inclusive franchise giveaway (which was won by a Purple Heart recipient). Jack was recognized by Entrepreneur.com for his branding talents in 2010 and served on the Board of Directors for the New England Franchise Association from 2011 through 2012. The businesses were sold in 2012. Jack is uniquely qualified for this role as we believe he’s the only one in the Pavement Maintenance industry with both line striping franchise and military experience. Reflecting upon lessons learned, the current marketplace and the continuing need to put veterans in business and to work, Jack realized combining his military background with his pavement marking experiences to create a unique veteran-focused business system would be a winning formula for G-FORCE™ veteran franchise owners and their customers. G-FORCE™ was born from a passion for entrepreneurship, customer service and helping fellow veterans. Bill Putnam brings 25 years’ experience in the concrete industry to the G-FORCE™ team. Bill started in the industrial concrete side of the business in the Carolinas, launching his own business and later selling to his partner. The last 15 years he has managed both small residential and large commercial flat work, as well as flooring and foundations. Bill has supervised crews as small as two to as large as 18 and he has overseen individual projects exceeding $70,000,000. Yes, that’s $70 Million Dollars. Bill’s focus on operational efficiencies and complex, large scale projects positions him ideally to manage our Line Striping Operations. Two of Bill’s family members served in the military. Owners and Operators of G-FORCE™ Parking Lot Striping of Tampa. Vish and Melanie have a combined 18 years of military service. Vish served two tours in Iraq as a Bradley Tank maintainer and Melanie has served both in the Army and Army National Guard. Owners and Operators of G-FORCE™ Parking Lot Striping of Pittsburgh. The McCloskey brothers also own and operate G.I. Haul, Pittsburgh’s premier Junk Removal Service. Mike served in the Army National Guard along with Luke and David served in the Marines. All three served in Iraq. G.I. 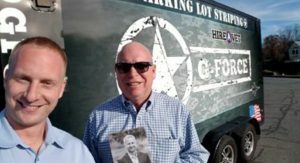 Haul has announced plans to Franchise their Junk Removal Service and, like G-FORCE, award Franchises exclusively to Military Veterans. Marine Corps Veteran Joe Lopez has partnered with his son, Andy, to launch G-FORCE™ Parking Lot Striping of Orlando. G-FORCE now covers large swaths of mid-central and the west coast of Florida. Joe served four years in the Marines as an Embassy Guard and later joined the Florida Highway Patrol, rising to the rank of Chief and recently retiring from that position.